Who says gluten free is not delicious? This must be the easiest apple pie ever. 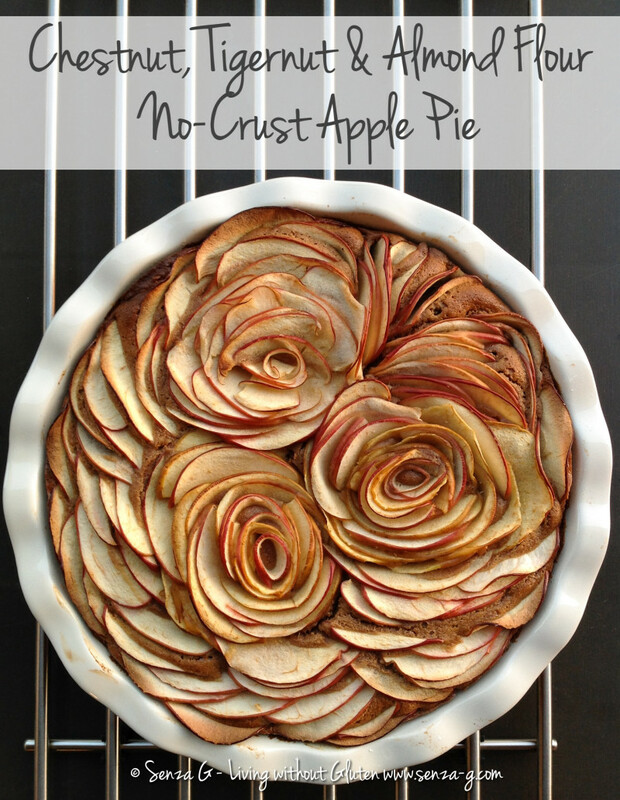 Perfect since there is no crust to prepare and made with some healthy natural flours! 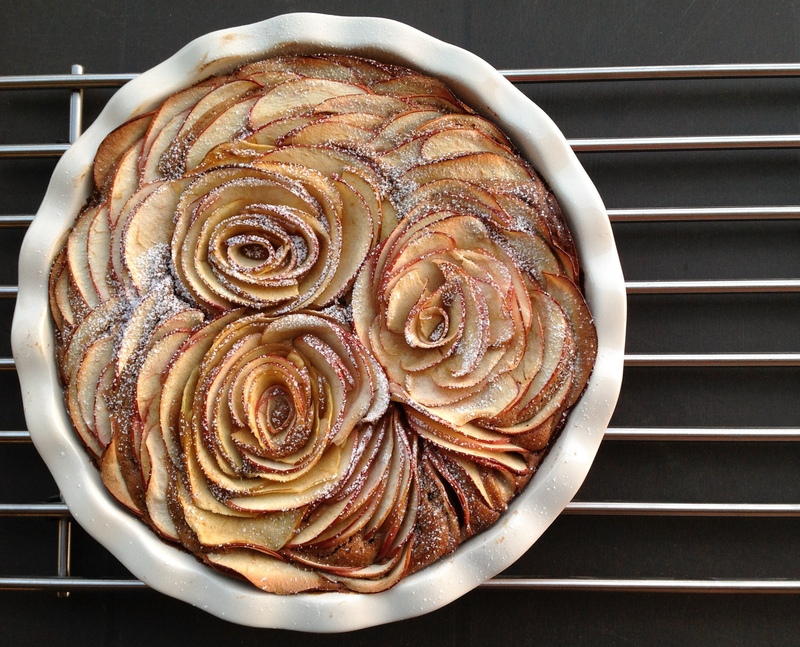 I found a little trick on how to make the apple roses, but if you find that difficult, you can just simply layer the apple slices all around. It will still taste as good. The roses may take a little time, but it makes it look so pretty! Soak the sultanas in the brandy until you prepare all the ingredients. Drain, reserving the brandy. Put all the ingredients including the reserved brandy, but with the exception of the sultanas and the apples in a food processor and blend on slow speed till mix is totally smooth. In the meantime, cut the apples in half and slice them thinly using a mandoline. Cut the slices in half. Take three small ramekins and start placing the apple slices around the edge, working your way in, and overlapping the slices, till you fill the ramekin, placing a rolled up very thin slice right in the middle. Do the same with another two ramekins. Set the remaining slices aside. Add the sultanas to the batter, combining well. Pour the batter into a greased and lightly floured pie dish. Level with a spatula. Take one of the ramekins, turn it over onto your cupped hand. The rose will slip out easily. Now, holding it tightly with your cupped fingers, gently place the rose face up in the batter. Do not worry if it opens up a bit. You will add more of the reserved slices later. Do the same with the remaining ramekins. 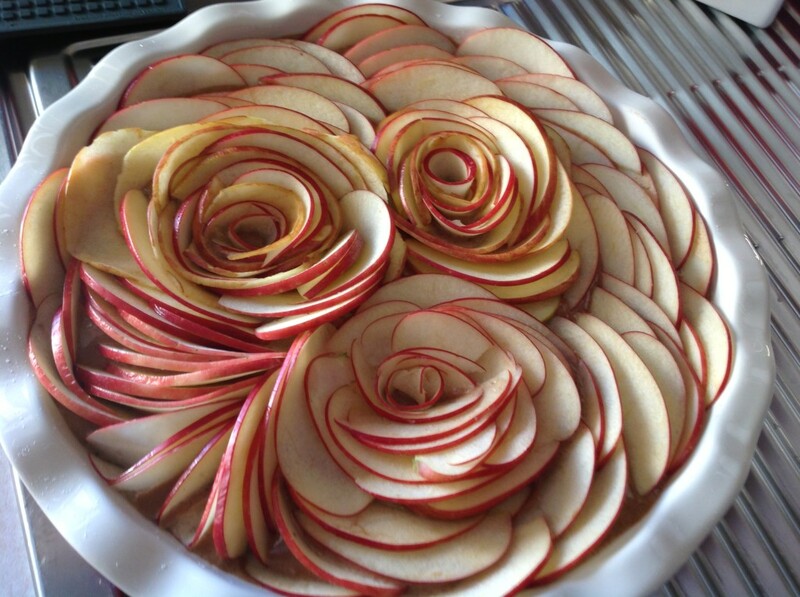 Now start filling up the remaining gaps with the remaining apple slices, in the same direction of the apple rose petals until the batter is totally covered. Place in the oven and bake for about 40 to 45 minutes. You can either leave plain, or else, when cool you can lightly dust with icing sugar.